URBANA, Ill. – Organic farmers are part of the fastest-growing food sector in the United States, yet breeding efforts have lagged, leaving farmers with few options for seed. Scientists, led by a group from the University of Illinois, are teaming up with farmers across the region to develop and test new maize cultivars with the goal of bringing high-quality, diverse options to the organic marketplace. And now, interested farmers and members of the public can learn more during a series of “aMaizeing” field days and workshops. The first event will take place July 19 at Wyatt Muse’s farm, located at 3100 North Rising Road, Champaign, from 8:30 to 11: 30 a.m. The morning session will feature corn breeding plots in which scientists are working to develop new organic cultivars from elite U of I lines and increase seed to be used by the on-farm testing network. Attendees will see an example of a strip trial similar to those established on more than a dozen cooperating farms. 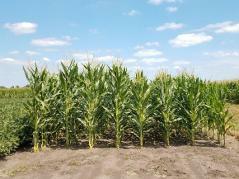 A similar field day will occur in Wisconsin on Sept. 13 at 8265 N County Road N in East Troy. It will feature organic cultivars developed by breeder Walter Goldstein to maximize nitrogen use efficiency and competitiveness against weeds. The field days will showcase the network of plant breeders, farmers, and end-users that are working together to design and support plant breeding and testing efforts to serve organic farmers in the region. Attendees will learn how various breeding strategies are used to develop new maize cultivars and how cultivar performance is measured. Additional afternoon workshops on the same days are reserved for project participants, but project leader Carmen Ugarte says it’s not too late to get involved. “Folks who have an interest in increasing access to seed with particular traits, such as nutritional or baking quality, color, or unique origin, or who want to help set breeding or network goals should get in touch to see if one of our afternoon workshops might be of interest,” says Ugarte, a research specialist in the NRES department at U of I. Ugarte can be reached at cugarte@illinois.edu.